Can You Tighten Loose Skin With Exercise? 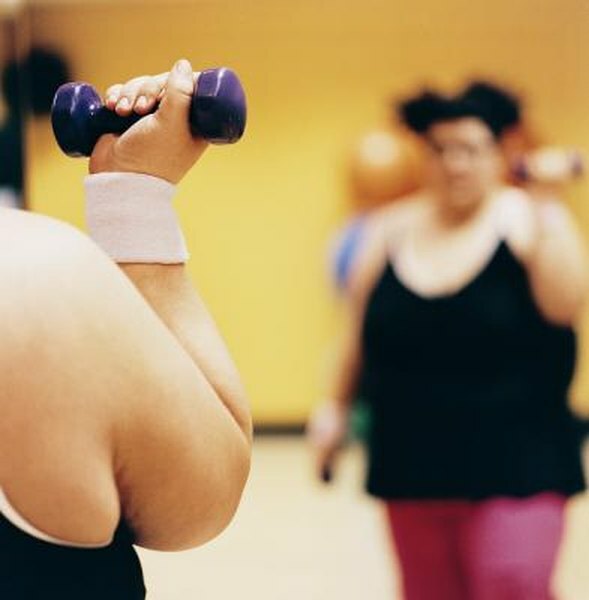 Loose skin after weight loss can be as damaging to your self-esteem as being overweight. Exercise cannot tighten your loose skin, but you can minimize the amount of loose skin you have. If you have excess skin, patience is key as you wait for your skin to adjust to your new size. Skin will often appear loose if you rapidly lose a large amount of weight. Excess skin occurs after weight-loss surgery or fad diets that quickly shed pounds before your skin adjusts to your new body frame. The amount of loose skin you have after you lose weight depends on your age and the amount of time you carried the body fat. Your skin is somewhat elastic, which allows it to be stretched beyond its normal state and then return to its pre-stretched state. As you age, your skin loses elasticity, so loose skin after rapid weight loss might be inevitable. If you focus on losing weight in small amounts, you give your skin a better chance to adjust to the slow changes to your frame, so focus on losing weight at one to two pounds per week through exercise and reducing your calorie intake. While you can't tighten loose skin with exercise, strength training increases the size of your muscles. As you build muscle, you minimize the amount of loose skin you experience as the muscle replaces fat. Use a healthy and slow approach. The Centers for Disease Control and Prevention recommend 150 to 300 minutes of moderately-intense cardiovascular activity and two strength training days per week. Keep a food journal so you have a record of the amount of calories you consume. Reduce your calorie intake by 500 to 1,000 calories per day in order to lose weight at a manageable one to two pounds per week. Your cardio exercises can consist of anything that keeps you moving and increases your heart rate, so running, swimming, dancing and jumping jacks are all examples. Strength-building exercises can be done with or without weight, but you will receive better results for minimizing the appearance of loose skin if you incorporate weights into your routine. Use dumbbells for exercises such as squats, lunges, biceps curls, deadlifts and triceps extensions. Your skin will get tighter as your body fat decreases, but this can take up to two years, says the Cleveland Clinic. Body contouring surgery is available if you lost massive amounts of weight and you've seen little to no change in your skin’s condition after you’ve kept your weight stable for over a year. Surgery is not always a option. According to the American Society of Plastic Surgeons, it can take a few years for your body contouring to be complete since the surgery is often performed in stages. No creams will tighten loose skin. Do You Lose Weight Faster by Eating Less or Exercising?